Jira & Bira name seems self-explanatory. How Atlassian partners benefit from the Atlassian-related event in Tel Aviv? And what to expect? Surprisingly sunny was Tel Aviv on Tuesday, November the 28th, 2017, the day our BigPicture salesman attended Jira&Bira. Tel Aviv beach on Jira&Bira day. Was it too late to pack up for Jira&Bira? Only on Monday morning, we decided we were flying to Tel Aviv that same evening. So, we almost missed the conference that we grade as potentially one of the most lucrative this year. Interestingly, we don’t rate equally high the concurrent Atlassian partners’ events in Germany and Austria that we filled as well… Even though the German markets make Jira’s mainstay in Europe. 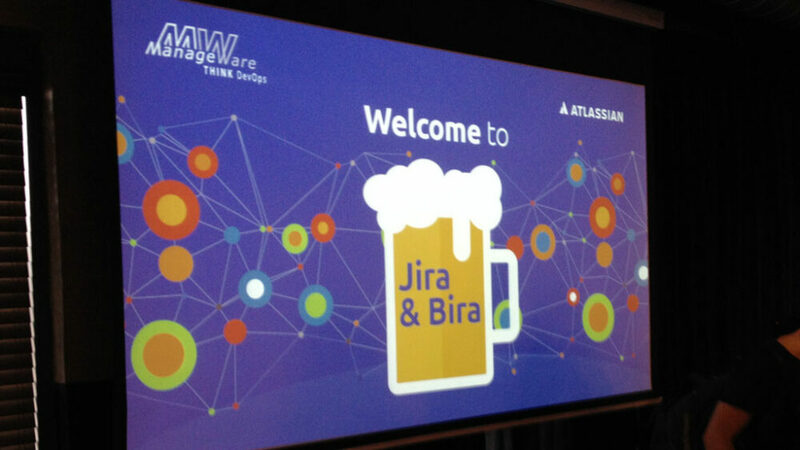 Do they serve beer at Jira&Bira? Yes. The event was held in Talk House, a recognized restaurant in the vicinity of Tel Aviv wharf. The hospitable Manageware team with Mark of SoftwarePlant (far right) holding Softwareplant booklet. Jira & Bira beer pads. Jira and Bira audience. Project management with BigPicture presentation by SoftwarePlant. Check the other Jira event in Tel Aviv: Methoda Atlassian Day.